I just finished reading my friend Joan Edward’s excellent book on elder care. Joan lovingly cared for her mother for many years and the book reads as if it is a friend telling you how to get through this difficult time of helping our parents in their last days. I consider myself in the “sandwich generation” at this time of my life. I need to help my parents more and more, yet I am also needed to babysit for my grandson and his soon to be born little brother. Joan’s book is an excellent guide to help us. She really did her homework in researching all that is needed in caring for the elderly. There are over 170 footnotes in the book. After telling us about her care-giving experience, she helps the reader to explore whether they can indeed be the one to care for their loved one by asking many pertinent questions. Step by step, Joan covers every needed base, including chapters on gathering important papers, making a “care-giver tool kit,” dealing with insurance, types of assisted living facilities, how to deal with your elder’s doctors and what to ask if they have to undergo a procedure of some type. She gives advice even on how to work with the billing department when a medical procedure’s cost is sky high. One piece of great advice I found on page 88. When you have taken your elder out on the road for more than 2 hours you should provide them with water and a snack before trying to get them out of the car upon your return home. That is something perhaps I would have forgotten during the stress of a road trip with Mom. Joan has done the hard part: pulling together all the needed information someone would need when taking on the difficult job of care-giving. Included in the back are checklists so one can evaluate what specific needs their elder has, and what they are still able to do for themselves. Also are charts to list where important information is located, a 12 week walking log, and a chart to keep track of bills that need paid, among others. She gives great advice on conflict resolution, and most importantly she tells her readers that they must take care of themselves first in order to be able to care for their loved one. As a non-fiction writer myself, I can really appreciate the time and effort Joan took to provide such a thorough guide for care-givers. Providing her list of references for each footnote itself is a treasure trove of information.You will also find plenty of websites listed throughout for enhanced learning. I am happy that I have this book on hand. It is available both in hardback and paperback. I know it will truly be like having a friend to help me as I care for my Mom and Dad. I am sure that Joan’s warmth and caring reflected through Joan’s Elder Care Guide will help many others also. People can email Joan at joanyedwards1@gmail.com. I am so happy for my friend Joan Y. Edwards. Not only did she help me in my own road to publication, but her first traditionally published book has just hit the market. I cannot wait to read it myself, and will be putting a review out just as soon as I can. But today I want to interview Joan, and share some of her good tips on writing and her path to publication of Joan’s Elder Care Guide. Joan is the kind of person who always makes you feel encouraged, so I hope this interview will inspire you, whether you are a writer, a caregiver, a nurse, or just happened to stumble upon my blog. 1) Tell us a little bit about yourself. I taught elementary school for 35 years. I love seeing the light bulb light up when children learn new things. 2) What led you to write Joan’s Elder Care Guide? 3) How long did it take you to write this book from first idea to finished product? It took me two years to write this book. I started writing the book in October 2008. I completed the manuscript and proposal in 2010. I submitted it to several publishers. I signed a contract with 4RV Publishing on April 9, 2011. 4RV Publishing sent the manuscript to the printer, Ingram’s Lightning Source on April 15, 2016. Five years and one week from the date I signed the contract. The editing process took from August, 2013 until April 15, 2016…two and a half years. I had two different editors. The editing process was a very humbling experience. I appreciate 4RV Publishing’s staff for believing in me and helping me make Joan’s Elder Care Guide a reality. 4) What was your most difficult thing to tackle writing the book? It was difficult to put things in strict categories. Things seemed to overlap. 5) What part did you enjoy writing the most? I enjoyed discovering different ways for caregivers to meet their needs and those of their elders. It made me feel helpful to share things that worked for me. It was fun researching other ideas that might make things easier for caregivers and elders. 6) Do you have any advice for those who want to traditionally publish their first book? Keep on submitting to publishers that you respect who publish the genre you’ve written. Study the craft of writing. Believe in yourself and your writing. Never Give Up. 7) As a middle aged grandmother who has two elderly parents herself, I ask what would you say would be the topmost priority in being a successful caregiver? To be a successful caregiver, take care of your needs. Plan time away from care-giving duties. Use family and friends or pay a professional so you can take time away. It’s vitally important. 8) What is your happiest memory from your care-giving experience with your mother? I enjoyed taking Mother to her favorite restaurant to meet up with her friends. She was used to going every day. I didn’t do that but I made it a priority to take her as many times as I could. I especially enjoyed the times that Mother, my husband, and I spent with my daughters and their families at the beach. 9) Is there anything else you would like to share with your readers? Sometimes you may not know the right questions to ask. When you have questions, keep asking until you get an answer. 10) How can people obtain your book and/or contact you? Information is given below on purchase information, the story of the artist’s cover and Joan’s other works and blogs. Thank you Joan, for being a guest today on my blog and allowing me the privilege of interviewing you today and best wishes with the sales of Joan’s Elder Care Guide. Review: Author appreciates all reviews. Prices are subject to change by the vendors. People can email me at joanyedwards1@gmail.com. Joan Y. Edwards is an author, illustrator, and retired teacher in North Carolina. Joan’s Elder Care Guide: Empowering You and Your Elder to Survive is published by 4RV Publishing. She wrote and illustrated picture book, Flip Flap Floodle, and self-published it with BookSurge in 2004. She is currently working on illustrations for her chapter book, Larry, the Terrifying Turkey. Her Never Give Up blog, http://www.joanyedwards.wordpress.com has over 340,000 views and 350 subscribers. She encourages writers, illustrators, and others to never to give up. Her website, http://www.joanyedwards.com has a multitude of Gospel-based devotionals, puzzles, and skits. Joan is a member of Children’s Book Writers and Illustrators (SCBWI). Her article, “Find Your Creative Edge,” appeared in the July-August 2011 SCBWI Bulletin. Edwards thrives on spending time with her family and friends. She presents interactive writing and motivational talks and workshops for children and adults for schools, writing groups, and conferences. She reads humorous and self-help books. For inspiration and self-acceptance, she heeds the wise teachings of Robert Schuller, Joel Osteen, Maxwell Maltz, and Tony Robbins. I don’t know how I stumbled across this book, but it looked interesting so I checked it out of the library. It really made me think. When our oldest was a teen, we sent him off on a bus to a Worldview Academy week in Miami, Ohio. I didn’t know too much about the camp, but thought it would help him in getting through the rough adolescent years. After reading this book, I have come to appreciate more what they try to do there and at other ministries for teens to help them shape their worldview, before it is destroyed by what they learn in the halls of academia. A Christiann worldview was something I did not receive as a teenager myself, and after reading this book, I realized I learned the hard way. For example, one day I sat crying in despair in the Hillman Library at the University of Pittsburgh. My faith was belittled and mocked by a liberal anthropology professor who taught us we all came from apes. Thankfully it did not destroy my faith. Another instance was when confronted with the abortion issue in nursing school. I never really considered it murder until I was sent to observe one firsthand in my s0phomore year. I grew up on a steady stream of progressive propaganda and didn’t even realize it. It was reflected by the movies I watched, the music I listened to and affected my whole outlook on life. Without faith, I would have concluded that life was meaningless and absurd, as expounded by Nietzsche in his writings. In this book, author Kevin Swanson sets about educating parents and high school children how our culture has come to be where it is today, by the slow and steady erosion of Judaeo-Christian values which started in earnest in the 1850s. Even before then, the damage started by thinkers like Thomas Aquinas, who separated the “sacred” from the “secular.” Humanists such as Rene Descartes, John Locke, and Jean Jacques Rousseau laid the foundation for the big changes which exploded in the twentieth century. Also discussed are Marx, Dewey, Darwin, Sartre, Mark Twain, Steinbeck and Hemingway, among others. Their literature formed the basis of my high school English reading. Sadly, most came from Christian backgrounds but somehow lost their way. Not only they were lost, but they helped many others to follow their example. On page 126, Swanson states that Charles Darwin, upon entering Cambridge University, wrote that he “did not then in the least doubt the strict and literal truth of every word of the Bible.” By the end of his life and completing his writings, he declared that the Bible is “no more to be trusted than… the beliefs of a barbarian.” What happened? I recommend this book to anyone who wants to learn how our society’s values have undergone such enormous change in the last couple of generations. For parents, read it to be forewarned against what your children are taught in the public schools. And if homeschooling, don’t make the mistake of thinking your children will be able to discern the difference of humanistic writings from what they are taught in church. Get yourself prepared by reading this book. Apostate: The Men Who Destroyed the Christian West was published in 2013 by Generations with Vision. Citations and a selected bibliography are included. The author is a homeschooling father who is also a pastor and the host of a daily radio show called Generations. I love when I find a book that really moves me to the core, that stays with me. I love a book that I cannot put down. I love learning more about the times and people that lived in the time of Jesus of Nazareth. Ted Dekker’s book, A.D.30 was all that and more. On a road trip with my parents this past weekend, I took along this book and found I could not put it down. When it got dark in the car on our way home, I pulled out a flashlight from my purse, in spite of feeling ill with a bout of bronchitis. It was that good. It helped me see another picture of our glorious Savior and His ways and dealings with people just like you and me, only that they lived in a different time and place. Published in 2014 by Center Street of Hachette Book Group, A.D. 30 is followed with a sequel, A.D. 33, which only came out at the beginning of October. I will definitely be reading it soon! Maviah, a rejected daughter of a Bedu king, is the main character and suffers a tremendous loss. Because of this, she is sent on a mission to avenge her loss and restore the honor of her father (who has been defeated and rendered speechless) by the Thamud with a sword of Varus. She goes on a long and dangerous journey to see Herod, the Jewish king in the time of Jesus. Two slaves of her father Rami are appointed to go with her: Saba and Judah. Together they cross a valley of death, the Nafud desert. Sandstorms and the loss of camels are only the beginning of their problems. Fear and hatred imprison Maviah and it seems she is destined to never live up to what she really is: a daughter of a Bedu king and royalty. But that changes when she meets the Man everyone is talking about in the land of Judea: a so called mystic named Yeshua. The very minute she lays her eyes upon Him, Maviah is drawn to the Savior of the world. There are many twists and turns in the plot and it kept me on the edge of my seat. I loved how the author instilled both deep meaning and a desire to read to the very end. Some of the book’s quotes about how Maviah’s thinking changed completely were amazing. Mr. Dekker painted with words a beautiful picture of our Savior, and that for us to know Him is to no longer be afraid. A quotation from Jesus’s teachings in the Bible begins each chapter of this book. In the end, an appendix provides references for the Bible verses that are used. Mixed in with the fiction, the events matched what was recorded by ancient historians, for example, the divorce of Herod from his first wife, Phasa, the imprisonment of John the Baptist, and the calming of the storm on the sea. For me, the story of Maviah did just that. Thank you, Ted Dekker. I love reading this baby book to my grandson. It is so interactive for little hands to lift the flap and touch different textures. The beloved Beatrix Potter characters are displayed in a guessing game all the while searching for Peter Rabbit. 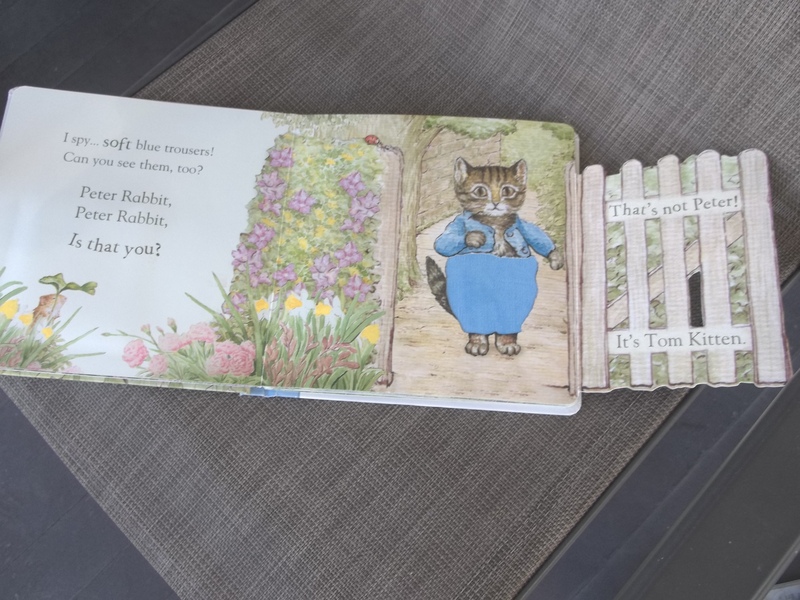 In a rhyming sing-song, baby will search each double paged spread to see if Peter Rabbit is hiding under the flap. Included are Jemima Puddle Duck, Tom the KItten, Squirrel Nutkin, and my favorite, Mr. Jeremy Fisher. 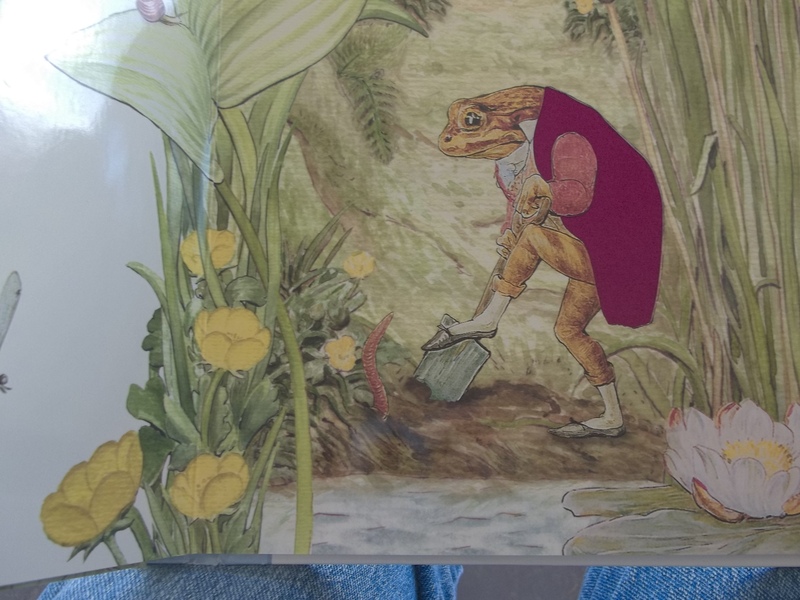 Speaking of Jeremy Fisher, my grandson’s dad asked me once when he was just a little boy if Mr. Jeremy Fisher was underneath the display glass at a science table at Carnegie Museum of Pittsburgh. I got such a laugh that day he thought the frog there was Mr. Jeremy! Ever since, Mr. Jeremy has been one of my personal favorites among the Beatrix Potter characters. The one downside, as I see some of the Amazon reviewers have stated as well, is that the book is not as durable as I would have liked it to be. My grandson’s book is already tattered, and I would suggest keeping it away from general access and use it as a “special” book. But if it came down to it, I would still rather the child to have the book and let it get tattered than bypassing it altogether. As you can see, the artwork is spectacular. Reading to babies and toddlers is one of the most important things we can do. They develop language skills and vocabulary just through enjoying books with the ones who love them. You can buy this book on Amazon, I got my grandson’s at Sam’s Club close to Easter time. I hope you might decide to check this book out if you have little ones at home. What are some of your other lift the flap touch and feel baby books? I would love to hear them! When we read about martyrs, it is easy to think of Isis spreading terror among the Christians in the Middle East.But China has been undergoing persecution for many years. In fact, Bob Fu, the author of China’s Double Agent, says that Christianity in China is under the worst attack now since the Cultural Revolution. I picked up this book at the library because I’d heard before about ChinaAid, the organization Bob Fu founded, which provides relief to Christians and others who suffer human rights abuses in China. His own story of coming to faith in Christ was a miracle. Fu was a university student, trying to get an education so he could help his impoverished family. He became one of the leading organizers of the student demonstrations for democracy in Tienanmen Square in June, 1989. I remember the horror I felt the day I heard of the students gunned down by their own government when they peacefully demonstrated for freedom. In this book, I found out that Bob Fu was one of them. He was a dynamic leader at his university, garnering support for the cause and had many friends. But after the disastrous massacre by the government, suddenly he was abandoned by all and under government surveillance, being forced to write confessions. Only one person stood by him, and he was ready to commit suicide. It was then someone handed him a tract with the testimony of a Christian in class one day so they could get him to stop crying. One thing led to another and Fu found Jesus in the midst of his despair. Thus, Bob Fu’s life was never the same again. The rest of the book tells of his evangelism, escaping China and founding ChinaAid while living in Philadelphia with his wife. He shares how he intervened on the behalf of many others being persecuted, and used his influence in the highest levels of the United States government. I was privileged to meet a fellow believer whose story was shared in this book. At a Voice of the Martyrs conference last October, I met Sarah Liu, who was tortured with an electric prong by the government in prison. I did not know how badly she suffered at the time, reading about it in this book helped me to gain a knowledge of what our fellow brothers and sisters are undergoing even at this very hour. Though most of us cannot go to China to help, we can pray and give our aid and support to our beloved brothers and sisters there. 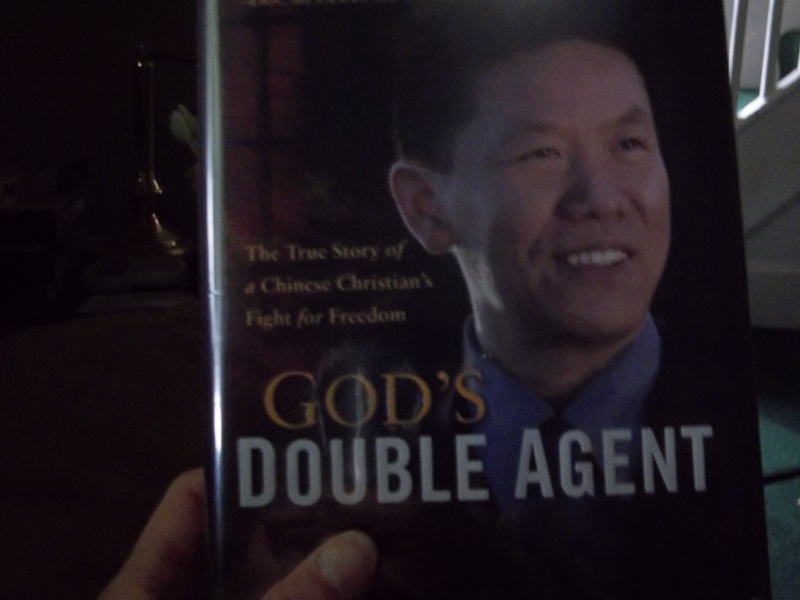 I recommend reading God’s Double Agent as it will enable understanding of how things really are in the nation of China.